Commercial Caulking is an important aspect of building maintenance and restoration. Commercial waterproofing services prevent air, water vapor, and precipitation from penetrating the exterior envelope. Proper sealant on commercial structure is crucial for the preservation of building components, and prevention of biological growth. We have experience removing and replacing failed caulking and control joints. We can perform caulking services with silicone or urethane sealant options. Additionally, we are experts at properly preparing the substrate with a grinder in order to ensure proper adhesion. We can apply caulking to control joints and we caulk window perimeters. If you are looking for a commercial caulking company, give us a call for a free commercial caulking quote. Our commercial caulking services include caulking glass to metal services. Often, window gaskets shrink and no longer effectively function as a moisture barrier. This allows water to enter the window system, and frequently the building as well. Our wet glazing services are performed by professional wet glazers who take pride in the appearance of their work. In most cases our wet glazing services are less expensive than control joint caulking per linear foot. Wet glazing curtain wall glass is especially important in order to preserve the integrity of the system. In addition to commercial wet glazing, we can provide window glazing for residential type windows, or in order to preserve historic windows. Puttying old windows can save substantial amounts of money versus window replacement. It is important to paint over window putty after it cures in order to protect the material from damaging UV rays. 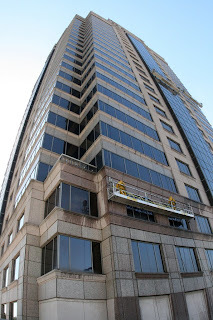 While most exterior sealant applications are covered within the caulking and wet glazing arenas, there are other commercial waterproofing services that we are able to effectively perform. The metal to metal joints in different types of architectural systems require maintenance. As these joints age, they often require caulking in order to preserve them as a functional component of the weatherproof facade. Other weatherproofing applications include caulking control joints, caulking window frames, and wet glazing. On large scale restoration projects, these areas often fail resulting in large amounts of water presenting itself on the interior of the window systems. Parking Deck Restoration and Expansion Joint Installation Parking decks require maintenance in order to function effectively. Parking decks are actually a conglomerate of moving parts, which must flex in order to offer a sound structure. When the building blocks of the parking deck expand and contract, the elements in between the building blocks wear out. For example, we are able to perform traffic deck caulking. The expansion joints in parking decks can be effectively replaced in order to prevent water from entering the decks below. Specialty joints like parking deck expansion joints require properly selected and installed expansion joint systems. We also offer crack sealing on parking decks in order to weatherproof the deck.